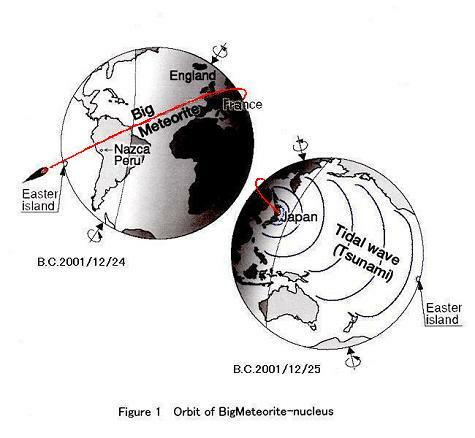 Figure of orbit of the huge meteorite which went half round the earth, and collided at the end of December in the Tohoku district of the BC.2001 year. The comet which passed this solar most recent was warmed by solar heat and softened. 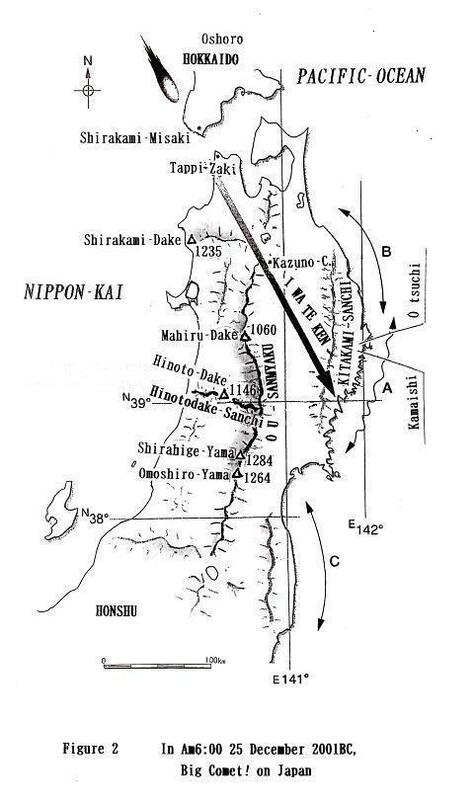 It was caught by the gravitational field of the earth before long and It described a spiral track from the Easter Island sky and penetrated and, through Nazca → Strait of Dover → Siberia →, collided to the Tohoku district of Japan. The European ancestors did the comet with the unlucky star where a witch got on. And because the color to fly, and to reach was red; of red clothes of Santa Claus became colored it. The huge red dragon went half round the earth. This passage place said "our territory!" and dropped a scorching huge stone! If it falls into the forest area, it becomes the fire. If it makes a circular low spot with a roaring sound on the earth, it is natural to think so that an ancestor leaves the awe and surprise to afterworld. The stone circle of the Stone Age that Norway and Sweden and Hokaido of Japan has is far distantly and cannot explain it by the spread of the culture. The ancestors named it "a dragon". Because a flight sound sounded with "Riyu ... "with a shock wave, the ancestors named it "a dragon". The person (Jofuku) of Mainland China came in quest of a big incident of Tokai in the Japanese Islands. A picture of the dragons is the montage image which person drew based on the story of people living there. I made a demystification by an article in front. The roaring sound that the flying meteorite emitted became the cry from a big mouth of dragon. The corner in the big head draws that　dragon flew in the sky while scattering a fire bullet. It was said that a lump of the fire held on the nail of the dragon was a lump of the fire that threw it to the passage place, and was dropped. □　To be continued ^^!